There’s nothing better than some warming comfort food after a cold water surf! This is one of my favourite recipes and warms you up on chilly days. 1.Preheat oven to 200°C. Line an oven tray with baking paper. Scatter the pumpkin over the tray. Drizzle with half the oil and season with salt and pepper. Bake in preheated oven for 30 minutes or until brown and tender. Meanwhile, to make the pesto, place the basil, pinenuts, parmesan and garlic in the bowl of a food processor and process until finely chopped. While the motor is running, gradually add the oil in a thin, steady stream until incorporated. Taste and season with salt and pepper. Bring the stock to boil in a saucepan. Reduce heat and keep at a gentle simmer. Heat remaining oil in a heavy-based saucepan over medium heat. Add the onion and cook for 5 minutes or until soft. Add the rice and stir for 2 minutes or until grains appear slightly glassy. Add the wine and cook, stirring continuously with a wooden spoon until the liquid is completely absorbed. Add the stock, a ladleful at a time, stirring continuously, allowing the liquid to be absorbed before adding more. 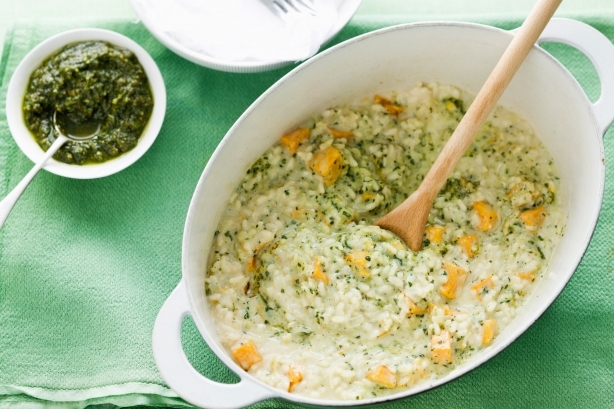 Cook for 20 minutes or until the rice is tender yet firm to the bite and the risotto is creamy. Taste and season with salt and pepper. Add the pumpkin and gently stir to combine. Add half the pesto and gently fold through. Spoon among serving bowls. Top with remaining pesto and serve immediately. ← Apricot, pistachio and cranberry quinoa porridge!